2011.03 Tacos Guadalajara in L.A. I was out this evening doing reconnaissance for the LoMos blog and couldn’t resist stopping at this truck for a snack when I passed it along the way. This used to be a stopping point for a Tortas Ahogadas truck, although I didn’t have the presence of mind tonight to ask if they belonged to the same operators. As I mentioned to Bandini (who reviewed this truck during his “30 Trucks in 30 Days” challenge in which he demonstrated the principle of Working Hard to Stay Awesome), I have seen a sidewalk trompo out front of this truck on weekend evenings, but never had the good sense to stop and try it out. Tonight, no such trompo luck (trompo luck is the best kind of luck), only the routine good luck of great tacos for $1 each. I rolled up and would not have been sure they were open for business, except for the man standing on the sidewalk enjoying a plate of tacos. There is no menu board. I asked the young assistant what was available and she recited the list. I asked for one each of the carne asada and the al pastor. Later the young assistant flattered me by asking about my cargo bike. This truck is unusual, as Bandini described, insomuch as it is not occupied from within, but rather opened up and operated from the sidewalk. More than meets the eye, this truck is a friendly Autobot. A stainless steel diamond plate apron folds down from the truck to create a secure standing platform. The taquera is standing in front of the plancha, and next to the young assistant below the bags of Cheetos and Taki is a fully stocked salsa bar with lidded, built-in compartments. If like me you also harbor secret dreams of throwing off that conventional, suburban lifestyle in favor of urban loft living in a vast, disused warehouse space (like in the classic movie Quicksilver), where a gutted conversion van rolled into the space can serve as your bedroom and your kitchen is a taco truck, then this would be a good style of taco truck to consider for that purpose. The taquera prepared the al pastor on the griddle upon my ordering it, abundant with caramelized onions (sorry about the blurry photo). It is sweet and rather saucy, and not unlike an Asian stir-fry dish. I garnished both tacos with the rojo, medium in spiciness and unusually tart. The carne asada was fairly average, and I preferred the pork. The tortillas were bilaminated and excellently leathery. 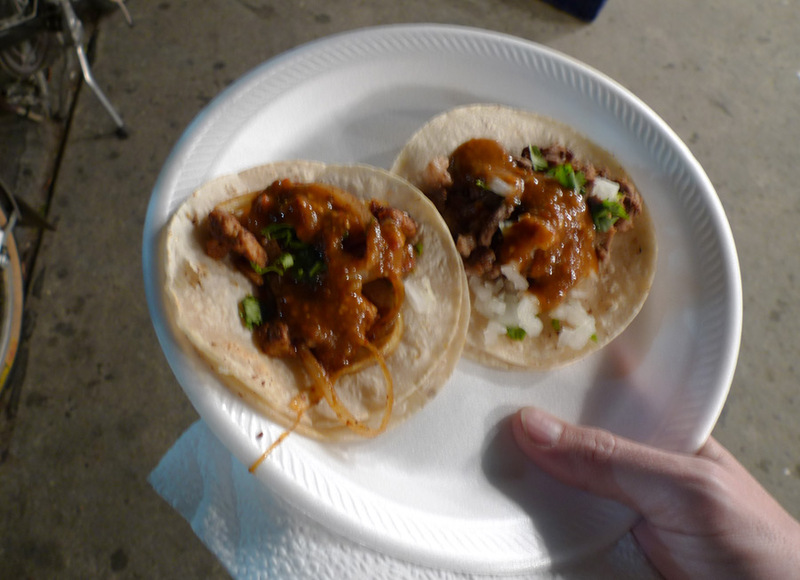 These were solid tacos to enjoy on the sidewalk at the righteous taco corner of Adams and Redondo. It is my belief, from daily observation, that this li’l van replaced the original Guadalajara torta truck while away for a spiffy new paint job. They jumped on the vacant spot. 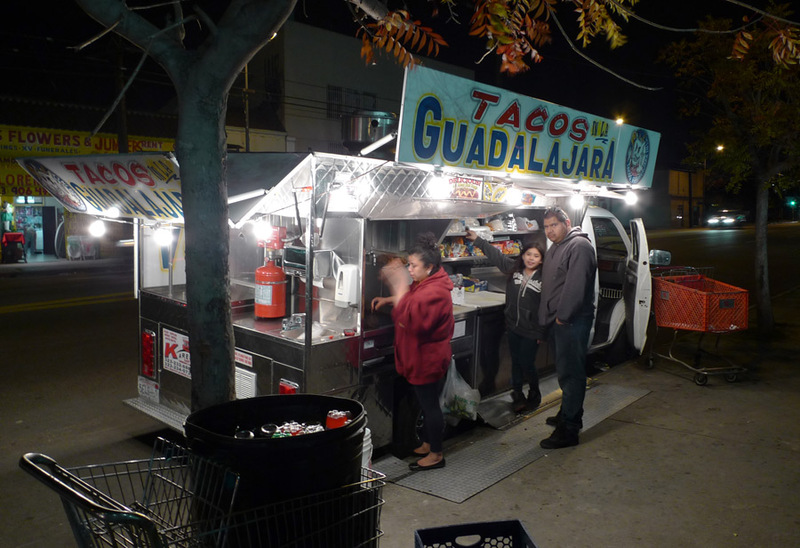 The Guadalajara torta truck is back with a new paint job – last seen on Adams right near there. Did you not see it? It features a devil character, iirc. Hmm, No, I haven’t seen the tortas truck in a long time, but I’m glad to hear it’s around. I want a drowned torta!